Please be advised that our guest rooms will be undergoing the Forever Young renovations through January 2017. The refresh should not interfere with your stay. We apologize for any inconvenience. 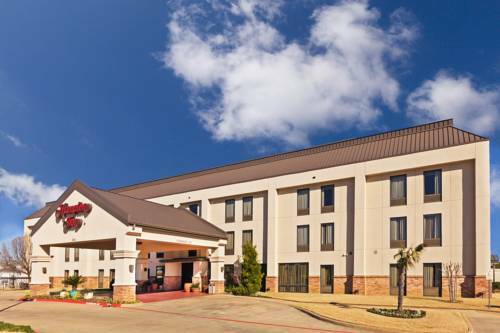 The Hampton Inn Paris hotel is located off Loop 286 on Pine Mill Road in historical Paris Texas. Our hotel is convenient to downtown Paris the civic center numerous shops and a golf course. The downtown Paris Texas square is home to a beautiful fountain antique shops and many historical sites. Within one mile of the Hampton Inn hotel are a number of great restaurants including Applebee*s Sirloin Stockade and Chili*s. Pat Mayse Lake Kimberly Clark Campbell Soup Paris Jr. College and Turner Industries are also nearby. All rooms of our Hampton Inn hotel are equipped with complimentary wired and wireless high-speed internet access coffeemakers a micro-fridge iron ironing board and hair dryer. Our Hampton Inn hotel offers 3 HBO and 3 SHOWTIME channels including SHOWTIME EXTREME. We also offer a complimentary hot breakfast business center fitness center outdoor pool and a whirlpool. We love having you here in Texas at the Hampton Inn Paris. all reservations that do not require a deposit held until 24 HOURS late arrivals and after 6pm must be guaranteed with a major credit card or advance cash deposit to hotel. all reservations must be cancelled by 6pm host time unless deposit required. Fresh Italian food prepared daily. Delivery available. Closed on Sundays. Special sections of this cemetery are set aside for circus performers and professional bull riders.